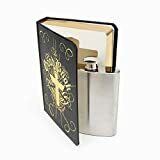 The Good Book Flask is the ultimate place to stash your booze. 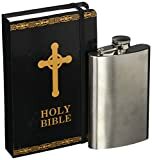 On the outside, it appears to be a regular Bible, but on the inside is a secret hidden compartment that hides a stainless steel flask. I don't recommend bringing it to Church, unless you at least fill it with wine. So wrong and yet so cool.